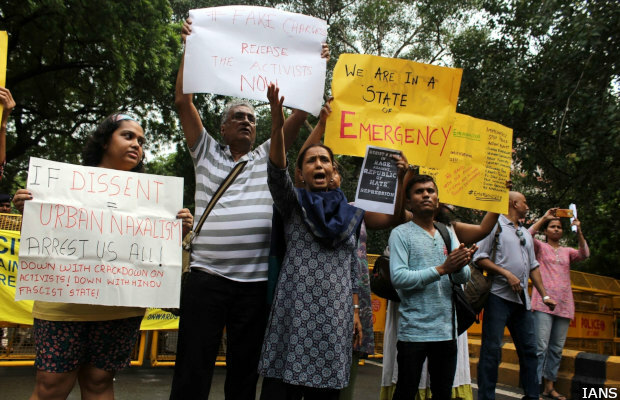 Mumbai: Two-thirds of trials completed under a 51-year-old law used to arrest five human-rights activists recently ended in acquittal or discharge in 2016, the latest year for which national crime data are available. As many as 22 of 33 cases (67%) under the Unlawful Activities Prevention Act, 1967 (UAPA) ended in acquittal or discharge in 2016, compared to 18% of cases that ended similarly under special and local laws (SLL), a category of laws applicable nationwide and which encompasses the UAPA, according to National Crime Records Bureau (NCRB) data. In 2015, 65 of 76 cases in which trials were completed under UAPA ended in acquittal or discharge. On average, 75% cases have ended in acquittal/discharge over three years ending 2016, as per our analysis of NCRB data. On August 28, 2018, five activists–Sudha Bhardwaj, Gaurav Navlakha, Varavara Rao, Arun Ferreira and Vernon Gonsalves–were arrested from different parts of the country for allegedly inciting violence in the Bhima-Koregaon riots in Pune. On January 1, 2018, a large number of Dalits, gathered at Bhima Koregaon to mark a 200-year-old historical event, were attacked by local groups opposed to the celebration. This led to widespread riots in the city and in other parts of Maharashtra. On September 1, 2018, the Pune police sought more time to file chargesheets against five accused–Sudhir Dhawale, Rona Wilson, Surendra Gadling, Shoma Sen and Mahesh Raut–arrested on June 6, 2018, under the UAPA, also over alleged Maoist links in connection with the Bhima-Koregaon violence, the Hindustan Times reported on September 1, 2018. Their 90-day judicial custody, which was to end on September 3, 2018, can be extended up to 180 days under the UAPA, if the investigation is not complete. In other cases, if the chargesheet is not filed within 90 days, bail can be granted to suspects. The UAPA has often been criticised for being oppressive. “The dangerous thing about UAPA is that both TADA [Terrorist and Disruptive Activities (Prevention) Act] and POTA [Prevention of Terrorism Act] had a sunset clause which UAPA does not,” said Susan Abraham, advocate at the Bombay High Court and wife of Vernon Gonsalves, one of the accused in the Bhima Koregaon riots case. Under a “sunset” provision, a law will cease to have effect after a fixed point of time. “The UAPA is a permanent statute. Both TADA and POTA, because of the sunset clause, had a time limit of two years after which they had to be sent to the Parliament for a new lease of life,” added Abraham. The other issue is that the law does not have the provision for anticipatory bail. “Bail is difficult because you have to prove that prima facie there is no case,” Abraham said, adding that the investigating agency now has six months instead of three for chargesheeting. As many as 922 cases were reported under UAPA in 2016, down 5% from 2014 (976) and up 3% from 2015 (897), NCRB data show. Over 2,700 cases have been registered over three years ending 2016. Manipur reported the most–327, or 35% of all UAPA cases–in 2016, nearly half the cases reported in 2014 (630). Assam came next (216), followed by Jammu and Kashmir (161) in 2016. All these are states are affected by insurgency/terrorism. Of the 3,962 cases slated for investigation in 2016, the police was burdened with a backlog of 76% cases. As many as 3,548 cases were pending investigation at the end of 2016, with a pendency rate of 89.6%. The pendency rate is estimated in terms of cases pending investigation at the end of the year per total cases for investigation during the year. In 2016, 1,488 cases were pending trial. Of these, 232 came in for trial that year, the remaining were held-over cases. Of these, trials were completed in 33 (22 acquitted/discharged and 11 convicted) cases. The conviction rate for cases under UAPA–cases convicted per cases in which trials were completed–in 2016 was 33%, as against 82% for all SLL cases, while the pendency percentage–cases pending trial per total cases for trial–stood at 97.8% in 2016, as against 82% for SLL cases. The Act accords absolute power to the central government. Under subsection 1 of section 3, chapter 2, if the central government is of the opinion that an activity is unlawful then it may, by notification in the Official Gazette, declare it so. Unlawful activity is that which “questions, disrupts” or “intends to disrupt”, “the sovereignty and territorial integrity of India”, according to the Act. It objects to claims which may contribute to cession of any part of India or which may cause “disaffection” against India. These definitions also formed the foundation of two defunct terror laws: Terrorist and Disruptive Act, 1985 (TADA) and Prevention of Terrorism Act, 2002 (POTA). TADA was allowed to lapse in 1995 and POTA was repealed in 2004. “Both were repealed because of growing public opinion against their misuse, but nothing like that can be done about UAPA,” said Abraham. The UAPA, originally passed in 1967, imported provisions from the discontinued acts with amendments in 2004, 2008 and 2012. Till 2004, “unlawful” activities referred to actions related to secession and cession of territory. Following the 2004 amendment, “terrorist act” was added to the list of offences. In 2012, UAPA was amended to further widen the definition of “terrorist act”. Now, threats to economic security–an umbrella term inclusive of food security, monetary and fiscal stability, etc; and actions like the counterfeiting of currency, raising of funds or the intention to aid organisations–were added to the original definition. Clarifications regarding “proceeds from terrorism” were also provided in an addendum. These included “properties” identified as being used in, intended to be used in or derived from acts of terrorism. They could also be identified as “instruments” in any form, monetary or otherwise. The Act accords the power to the investigating authority and the courts to forfeit property before the actual conviction. In 2016, UAPA cases were categorised under “offences against the state” in addition to crimes recorded under the Indian Penal Code. GN Saibaba, a Delhi University professor, was arrested under the UAPA in May 2014 for being “an urban contact” of the banned Communist Party of India (Maoist) outfit in Gadchiroli, Maharashtra. He was later sentenced for life in 2017. Many expressed outrage over his conviction because he is 90% disabled. Maoist leader Kobad Ghandy was booked under the UAPA in 2009. He was acquitted of charges under Section 20 and 38 (member of banned outfit and furthering its activities) of UAPA, but convicted for cheating, forgery and impersonation under provisions of the IPC in June 2016. Out on bail in 2017, he was re-arrested in days after his release by Jharkhand Police. In the last two years, environmental activists like Thirumurugan Gandhi too have been implicated under the same law. Gandhi, who was arrested in August 2018, was an active participant in a campaign against the eight-lane Chennai-Salem green corridor project and the police firing on the anti-sterlite protestors in the Thoothukudi protests against the Sterlite Copper plant.